When the historic St. Charles Avenue streetcar comes to its rattling, end-of-the-line halt at the edge of the French Quarter, visitors step out of one city icon and immediately encounter another – New Orleans pralines, those intensely sweet disks of sugar, butter and pecans. The streetcar stop at Canal and Carondelet streets has for many years been the territory of praline street vendor George Lee Clark. A tall man in his 50s, his face perpetually shaded by the brim of a white Panama hat, Mr. Clark sells his homemade pralines from a plastic bakery crate slung from his neck. Mr. Clark has been selling pralines on the city’s streets for more than 30 years – a long career but nonetheless a mere blip in the history of this distinctive Southern candy that stretches back to New Orleans’ colonial origins. Indeed, the praline – like New Orleans itself – started out with aristocratic French roots but grew into something quite its own here in the South. There are many variations on the story of how the praline came to be, but most of them revolve around the manor house of the 17th-century French diplomat Cesar du Plessis Praslin – a name that later morphed into the term for the candy. A chef in the kitchen here developed a technique for coating almonds in cooked sugar which, competing stories hold, were used by his courtly employer either as a digestive aid or as gifts to the ladies he visited. In France and elsewhere, the word praline is still used as a generic term for any sort of candy made with nuts. These early confections traveled with Frenchmen to their new colony on the banks of the Mississippi, a land where both sugar cane and nuts were cultivated in abundance. In local kitchens, Louisiana pecans were substituted for the more exotic almonds, cream was added, giving the candy more body, and a Southern tradition was born. The candy’s winning flavor has led to worldwide popularity, and, as such things go, varying pronunciations and hybrid recipes. 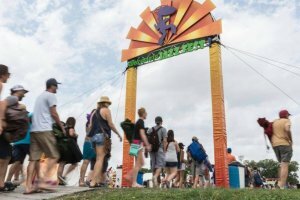 For the record, the local and proper pronunciation is “prah-lean,” while the nut most commonly used in it is pronounced “peck-on.” Just remember that, in New Orleans, a word pronounced “pray-lean” means nothing except, perhaps, a posture the supplicant faithful assume while petitioning God. Even before the Civil War and Emancipation, pralines were an early entrepreneurial vehicle for free women of color in New Orleans. In 1901, the Daily Picayune described in nostalgic terms the “pralinieres,” or older black women, who sold pralines “about the streets of the Old French Quarter.” They were often found patrolling Canal Street near Bourbon and Royal streets and around Jackson Square in the shade of the alleys flanking St. Louis Cathedral. And in the 1930s, the Louisiana folklorist Lyle Saxon, writing in the book “Gumbo Ya-Ya,” documented praline sellers “garbed in gingham and starched white aprons and tignons,” or head wraps, fanning their candies with palmetto leaves against the heat and bellowing the sales pitch “belles pralines!” to passersby. 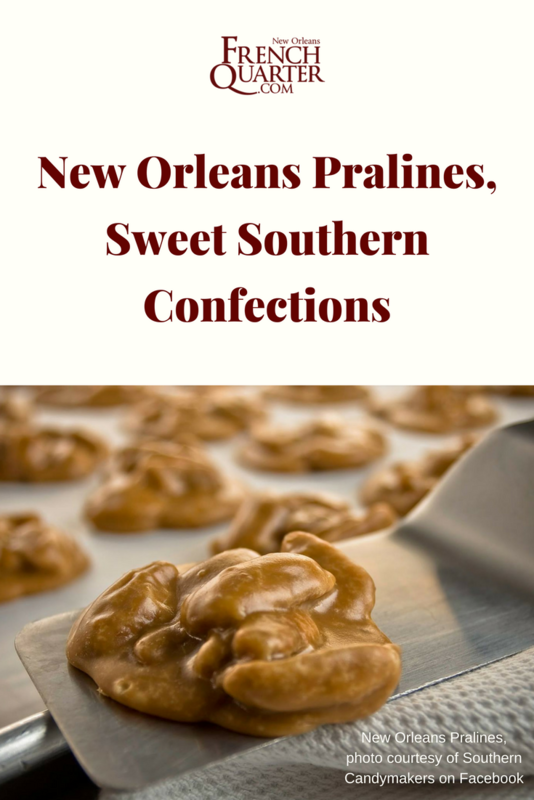 Today, pralines can be found in most convenience stores and supermarkets around New Orleans, as well as in a great many gift shops. More memorable for the visitor, however, is a trip to one of the many praline specialty shops in the French Quarter. Some of these businesses are quite old, tracing their roots back to the beginning of the previous century, such as Laura’s Candies (331 Chartres St., 504-525-3880) established in 1913, or the even older Evans Creole Candy Factory (848 Decatur St., 504-522-7111), started in 1900. Some sport open kitchens so visitors can watch the simple, but nonetheless fascinating, process by which sugar, cream, butter and nuts are united and transformed into pralines. From metal vats, dollops of the gooey pralines-to-be are spooned onto marble slabs to cool. The air inside these shops can be dangerously sweet at times, swimming with the warm smells of commingled sugars and butter. Dieters are advised to watch through the shop windows from the relative safety of the sidewalk, or even avert their eyes altogether. A basic praline recipe calls for brown sugar, granulated sugar, cream, butter and pecans. Naturally, many other variations have cropped up, including pralines flavored with shredded coconut, rum, vanilla, chocolate and peanut butter. But with even the traditional recipe, no two praline makers seem to produce the same candy. Pralines from Aunt Sally’s (810 Decatur St., 800-642-7257), for instance, are flat and thin with a multitude of chopped up pecan bits, while those from Southern Candymakers (334 Decatur St. and 1010 Decatur St., 800-344-9773) just down the street are fatter globs with larger, halved nuts embedded in the sugar. 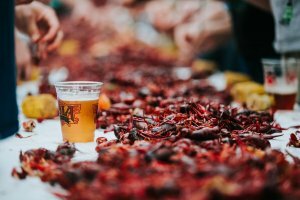 Below is a simple recipe for trying your hand at this traditional New Orleans specialty. Combine sugars and cream in a heavy 2-quart saucepan and bring to boil over medium heat, stirring occasionally with a wooden spoon, until mixture forms a thick syrup. Add pecans and butter and continue to cook over medium heat, stirring frequently. Remove saucepan to a heatproof surface (such as a wire rack) and let cool for 10 minutes. Use a tablespoon to drop rounded balls of the mixture onto sheet wax paper or foil, leaving about 3 inches between each ball for pralines to spread. Allow to cool.